This Premiere episode of Unstuck JOY! will answer the question: Feminine vs. Masculine Traits – Can They Play Well Together? And, Vicki will invite YOU to play along with her new Art Visioning process – a fun, creative, transformative spiritual process of using simple art journal prompts to discover your True Self and live Unstuck JOY! This show’s prompt is Discover Your Female Archetypes! What is Art Vision Journaling? It’s a fun, creative, messy, powerful, for-your-eyes-only vehicle to discover your own soul revelations and live more JOY! Vicki’s Art Visioning process encourages you to align with the Universe, ask deep questions about soul topics, and record your discoveries in an art journal with the help of Vicki’s simple art journaling prompts. Not feeling super artsy? NO problem! Art Visioning can be tailored to YOUR comfort level. During the show, Vicki will explain the process so you can evolve toward being your True Self. Recording your discoveries in your Art Journal will help you see how you are progressing on your journey. Join Vicki each month on Unstuck JOY! to play along! Let’s create our way to soul clarity together! Memoir Art of the Day - Inner Beauty Blooming. 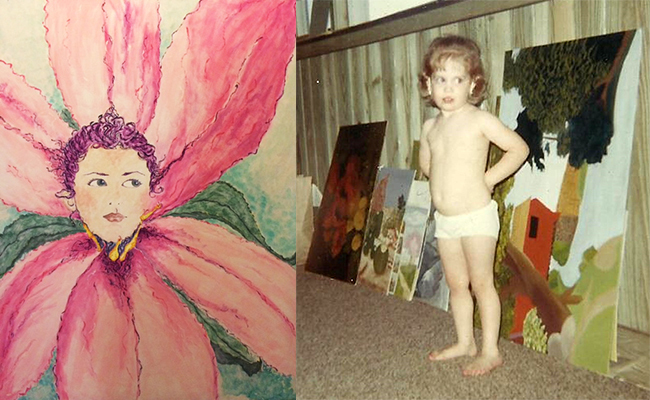 Vicki painted the first portrait on the left, Inner Beauty Blooming, without ever having seen her toddler photo on the right (didn't even know it existed). Same exact off-to-side stare! Remarkable!